Figure 5.7. 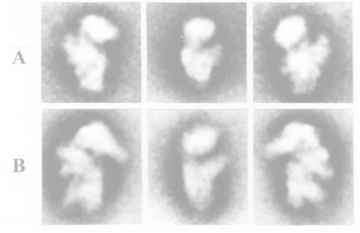 Averaged images of negatively stained 30S (upper row) and 40S (lower row) ribosomal subunits in the same three projections as shown in Figs. 5.5 and 5.6. (Original photos by V.D. Vasiliev). see Section 7 for more details). 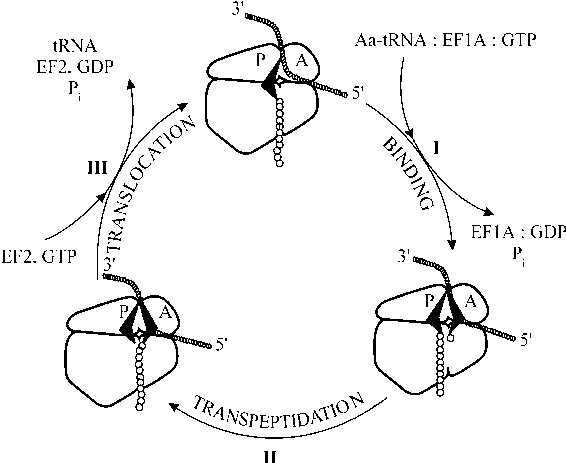 Averaged images of the large ribosomal subunit of E. coli (Fig. 5.9) make all details traceable in individual particle images clearly revealed. Again, the deep groove is seen to separate the head (CP) from the remainder of the subunit, the groove being deeper on the side of the L1 ridge than on the side of the L7/L12 stalk. One can see that the body of the subunit is bifurcated on the side opposite the head. 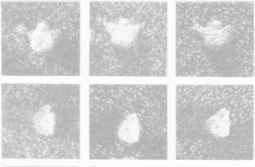 In addition, the averaged images demonstrated that many of the smaller details are not random features but are reproducible in numerous images. The eukaryotic 60S subunit has all the same main morphological features.